22,508 others viewed this post. This is what happens when two space nerds team up on the same target! 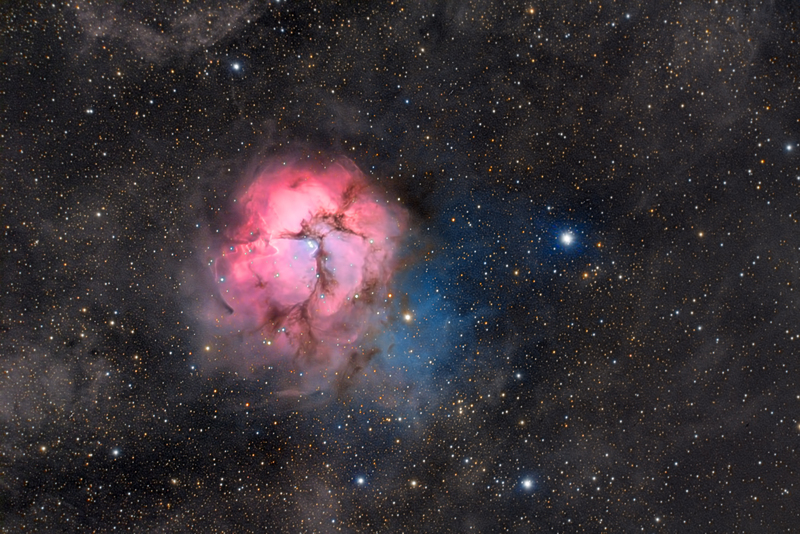 +john mills and I planned ahead of time to capture the Trifid Nebula (M20) with roughly the same field of view configuration and framing/rotation so that we could combine our data later. John took the Hydrogen Alpha from his backyard in Sydney (total 1.6 hours) and I took the colour data from mine in Byron Bay (total 1.5 hours). PixInsight helped align and process the stacks separately which were merged in Photoshop. I’m really quite happy with how it turned out! I was shooting with Celestron 9.25″ Edge HD / F6.3 reducer / QHY12 Colour CCD and John was shooting with William Optics 110T / +Atik Cameras One Mono w/ Astronomik Ha filter.